GetUp is a unique political organisation in Australian politics. Since their formation in mid-2005 they have accrued over 1,000,000 members, and fundraise about $8 million annually, from mostly small donations. In 2016 they had their most successful election campaign so far, in terms of both member mobilisation and political impact. Climate change is routinely the most important issue identified by their membership and GetUp had originally planned their campaign for 2016 as the “climate election”. They also found via Facebook analytics that climate was popular and topical with their base. GetUp was also committed to including economic fairness, predominantly hospitals, as a focus. During the campaign they found that some climate issues broke through, such as the Great Barrier Reef and renewables; but their election campaign strategy became much more tightly focused on the other three areas, especially on local issues in electorates with “hard-right” politicians who they argued were dominating the policy agenda. However, focussing only on GetUp’s policy agenda misunderstands the premise of the organisation. GetUp is best understood as a hybrid campaigning organisation: it uses both insider and outsider oriented interest group tactics for engaging political elites, its membership, and the mass public. It is also hybrid in that it simultaneously uses both offline, on the ground fieldwork with digital tactics. Increasingly, all kinds of political organisations find it necessary to run both fieldwork and digital campaigns, yet GetUp is part of a small group of “born digital” organisations that have reconceptualised all dimensions of campaigning, including membership, fundraising and tactics. This strategic distinction between traditional political organisations and hybrid campaigning organisations is often purposefully ignored in political and media debate. GetUp pioneered the use of digital campaigning tools in Australia, starting from mass emails and online petitioning over ten years ago, to the use of campaigning system software like NationBuilder, and recently using Facebook in a targeted way. David Karpf, in his book Analytic Activism, points out that online campaigning organisations share a culture of digital testing and listening that means a constant monitoring of an array of data collected from social media engagement rates, member response to calls to action in emails, to profiling volunteers and activists. GetUp suggested that their use of digital techniques in the 2016 election was inspired by the hybrid campaigns run by Bernie Sanders in the USA and Justin Trudeau in Canada. Importantly, most ordinary citizens are likely to use Facebook, and various studies consistently show that it is the leading social media platform for accessing everyday information on news and politics. GetUp has around 400, 000 followers on its Facebook page, and have deliberately tried to increase this community over time, with many of their campaigners as interactive participants in Facebook-based conversations and subsequent calls to action. 10% of posts had over 10,000 people engage with them (engagement comprises the sum of likes/reactions, shares, and comments on a post); with an average of 4,571 people engaging with any election post. Data on Reach (the number of people who saw a post) is not available but even if a simple estimate of Reach is applied, the election led to substantial Facebook engagement for GetUp. That is, the average post with 4571 publicly visible engagements (likes/shares/comments) could have 200 friends view it (the median number of Facebook friends a user has) leading to a further million views. GetUp told me about the high success for their calls for donations via Facebook posts for their hard-right politicians campaign. Their most shareable content came from GetUp’s economic fairness campaign on MNCs, health and hospitals, and the economy generally. Claims are made of the potential for Facebook to move beyond being a substitute media and broadcast-only site to produce political conversation and interaction. Yet only a small proportion of the overall engagement is comments and debate. There was an average of 300 comments across all election posts, and an average of 790 comments for a subset of the 10% most popular posts; with two posts focussed on Peter Dutton attracting the most debate (around 2200 comments). This suggests that successful political use of Facebook is multi-faceted: sharing and liking is important as it promotes core messages and ideas into a larger networked community; whereas commenting and active debate provides incentives for mobilisation, particularly fundraising for campaign work. Yet focusing on posts on GetUp’s public Facebook page alone is only part of why this was considered “the Facebook election” for GetUp. Over 1,400 pieces of content, that included Facebook information posts and short videos, were paid for and shared by GetUp over the election campaign, and were targeted at 29 of Australia’s most marginal lower house seats. In sum, GetUp’s targeted digital advertising program reached 830,000 voters in these electorates. Most of these posts appeared as Facebook sponsored advertising in the newsfeeds of voters in targeted marginal electorates; several were also translated into Chinese, Arabic and Vietnamese. 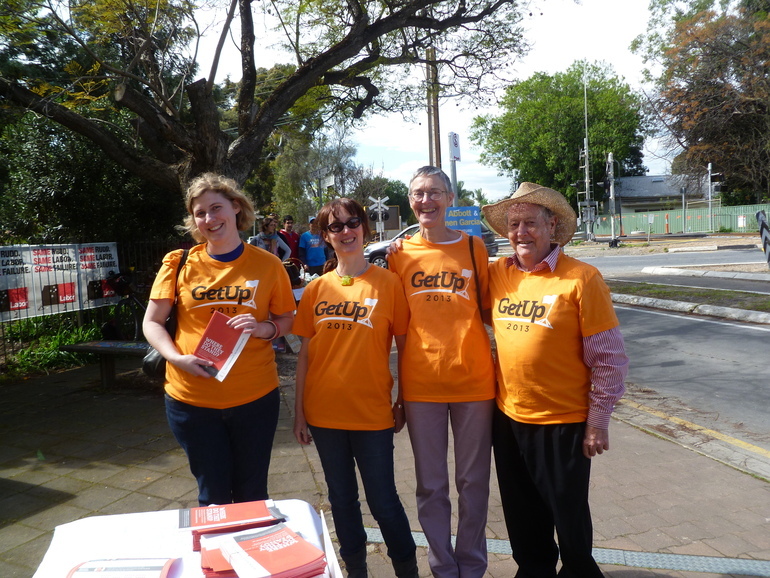 GetUp saw this as a wholly different audience, and crafted messages that would not necessarily resonate with their members but were aimed at swinging voters, focussed on economic fairness and hospital funding, and not on climate change. They paid for their ads to appear in Facebook newsfeeds of commercial media and celebrities. This personalised digital advertising as political campaigning is important to understand in the Australian political context, and was purportedly used by most parties during the WA election in 2017. GetUp fundraised and spent at least $3 million during the 2016 election campaign. This is a significant amount for a mid-sized third party organisation, but is less than the ACTU who were estimated to have fundraised between $10-20 million for their election campaign. The “Facebook election” campaign and subsequent success for GetUp was an important watershed moment, suggesting that hybrid fieldwork and digital strategies will be important for other Australian political actors. Indeed, many of the media articles written about GetUp after the election praised their tactics and urged others from all sides of politics to emulate them. This included Cory Bernardi’s call for a conservative version of GetUp to revive his earlier attempt at starting CanDo after the 2010 election, and leaders within business lobbying organisations, such as the Business Council of Australia, suggesting they had much to learn. Since the 2016 election GetUp has come under increased scrutiny for both its funding sources and its political alliances. However, they are largely unperturbed and have deliberately used the increased scrutiny to fundraise for campaigning work for the next election where they will continue their strategy of targeting individual politicians they deem to be “hard right”. This blog is adapted from the author’s forthcoming chapter on GetUp’s election campaign in the book Anika Gauja, Peter Chen, Juliet Pietsch, and Jennifer Curtin (eds) (2017) Double Disillusion: the 2016 Australian Federal Election, ANU Press: Canberra. Ariadne Vromen is Professor of Political Sociology in the Department of Government and International Relations at the University of Sydney. Her new book Digital Citizenship and Political Engagement charts the effect of GetUp on Australian advocacy and political campaigning. ← A Politics of Disillusionment?